I could not wait for Thursday night to get a chance to play in my room. It's so nice and comfy now that it's all done. I plan to do a little scrapping this weekend. I have a layout that I can't wait to get started on. I was talking with my mom on the phone last night telling her I didn't know what to do for today's Stampin' On Friday video. She said "Lawn Fawn". Great idea...Thanks mom! Have a great weekend everyone. I'll be back tomorrow to announce the winner of the Simply Charmed Cricut cartridge. Click HERE for a chance to win. Hi Christina all your cards are just beautiful. Love the pine wheels and the colors you used on this card today. Thanks for sharing! hi christina.I love your card, so cute !! Thanks. Hi Christina, having coffee and enjoying your pinwheel video. Love all your videos and ideas. Great Work! Just love the pinwheel idea so summer ! Great card idea . Cute card! Great tip about the block on your desk. I just found a "lost" stamp I have been missing for almost a year!! Adorable card ~ Great paper! I too like your idea of the clear block on your table. I have trouble keeping track of little stamps as well! Thanks for all you share with us! love the card, cute idea. Love your videos,very inspiring. Lovely card today...love lawn fawn too! What a cute card for summer. It brings wonderful memories of the past. Your talent is so much fun to watch. Thank-you for sharing. 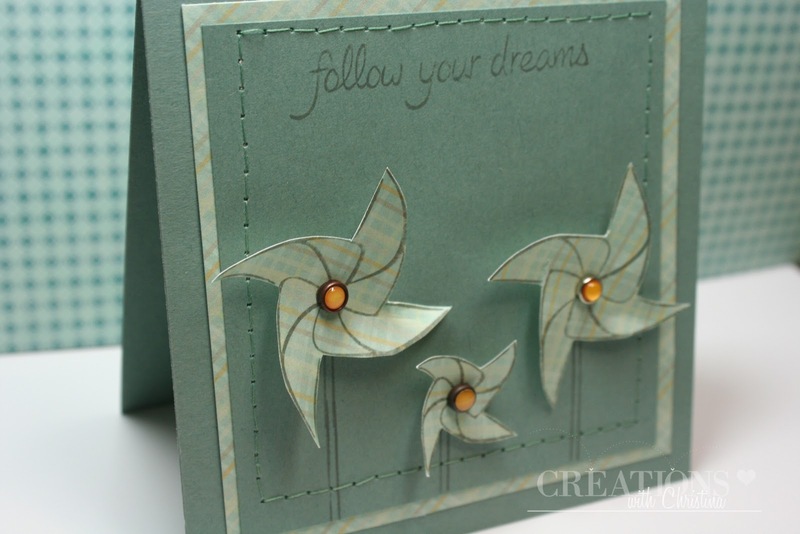 I really like your little pinwheel card and I think you did a good job sewing. I keep wanting to try stitching on a scrapbook layout and just forget to. The pinwheels are adorable! I love the colors too. Thanks for the stamp block tip, I will be using that!